Abstract: Triple-negative breast cancer (TNBC) remains the poorest-prognosis breast cancer (BC) subtype. Gene expression profiling has identified at least six different triple-negative subtypes with different biology and sensitivity to therapies. The heterogeneous nature of TN tumors may justify the difficulty in treating this BC subtype. Several targeted agents have been investigated in clinical trials without demonstrating a clear survival benefit. Therefore, systemic chemotherapy remains the cornerstone of current clinical practice. Improving the knowledge of tumor biology is mandatory for patient management. In stages II and III, neoadjuvant systemic treatment is an effective option of care. The achievement of a pathological complete response represents an optimal surrogate for survival outcome as well as a test for tumor drug sensitivity. In this review, we provide a brief description of the main predictive biomarkers for tumor response to systemic treatment. 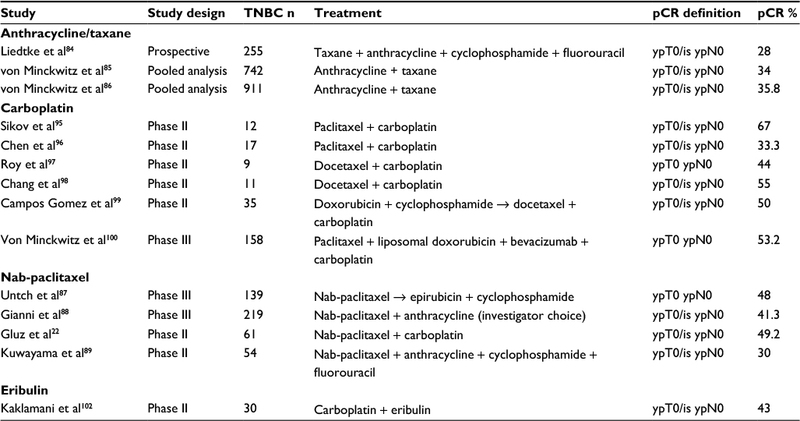 Moreover, we review the treatment strategies investigated for TNBCs in neoadjuvant settings focusing on experimental drugs such as immunotherapy and poly [ADP-ribose] polymerase inhibitors that hold promise in the treatment of this aggressive disease. Therefore, the management of TNBC represents an urgent, current, unmet need in daily clinical practice. A key recommendation is to design biology-driven clinical trials wherein TNBC patients may be treated on the basis of tumor molecular profile. In the early stages, the use of neoadjuvant systemic treatment (NST) is the standard of care in TNBCs. Patients who achieve a pathological complete response (pCR) with primary therapy have improved survival outcomes.3,4 Standard neoadjuvant regimens include anthracyclines, taxanes, and cyclophosphamide.5,6 Platinum-based chemotherapy has been proposed but is not yet recommended by available guidelines. Different systemic treatment options have been investigated besides the use of chemotherapy.7–12 However, there are no approved targeted therapies for TNBC in the neoadjuvant setting, although many different drugs have been studied and still others are currently being tested. Clearly, there is a major need to better understand the characteristics and the clinical behavior of TNBCs with an aim to develop effective treatments for this BC subtype. The identification of molecular targets is essential for the design of clinical trials that investigate new treatment strategies. In this article, we review the literature on the use of NST in TNBCs. We focus on the molecular markers able to predict response/resistance to therapies. Moreover, we review the recent data on experimental drugs tested, and discuss findings concerning immunologic checkpoint inhibitors in this population. The main, ongoing clinical trials conducted in this field are reported as well. The known, investigated, predictive factors of response/resistance to NST in patients with TNBC are shown in Figure 1 and listed further. Figure 1 Triple negative breast cancer (TNBC) molecular subtypes classified according to gene expression and the main involved pathways. Each of these subclasses show varying pathological complete response (pCR) rates following standard neoadjuvant chemotherapy. Promising therapies for every molecular subtype have been suggested. Abbreviations: TNBC, triple negative breast cancer; pCR, pathological complete response. Since the last decade onward, the immune system has been under investigation as a possible target in the management of different cancer subtypes. Tumor-infiltrated lymphocytes (TILs) have been identified in both tumor and stromal tissues. Intratumoral TILs (It-TILs) are lymphocytes that have a direct interaction with cancer cells, whereas stromal TILs (Str-TILs) are lymphocytes localized in the peripheral stromal area. Considering BC subtypes, TNBCs have the highest tumor TIL expression (~20%) compared to other BC subtypes.30,31 In particular, the IM subtype of TNBC is characterized by high presence of immune cells, antigen presentation, and activation of immune pathways.21 Clinical data suggested a predictive role of TILs in terms of pCR in patients treated with NST, mainly with platinum regimens.32–34 A prospective evaluation of TILs in the GeparSixto trial found that lymphocyte-predominant (LP) BC, defined as tumors with lymphocytic infiltrate greater than 50%, were more likely to achieve pCR as compared to non-LP BCs (59.9% vs 33.8%; p < 0.001).35 The addition of carboplatin to anthracycline and taxane in LPBCs further increased the pCR rate up to 75% (p = 0.002).35 The predictive role of TILs primarily suggested by some small retrospective data36–39 was confirmed by the large meta-analysis present at the SABCS 2016, where a total of 3,771 tumors from the clinical Gepar studies (GeparDuo, GeparTrio, GeparQuattro, GeparQuinto, GeparSixto, and GeparSepto) were evaluated for the presence of TIL.40 These results suggest TILs are a strong predictive marker for response to NST in all BC subtypes.40 This predictive value was translated into a survival benefit in the TNBCs group. The presence of TILs in residual tumor disease after primary chemotherapy seems to be related to more favorable long-term outcomes as well.40 Another retrospective cohort of 278 patients with TNBCs correlated TIL presence with a risk reduction of metastasis and death. The major prognostic relevance of TILs was found in patients with residual tumor >2 cm and/or node metastasis.33 These authors hypothesized a possible use of TILs for selecting patients with high risk of relapse after NST. A comparison between TIL expression in the BC tissue before and after chemotherapy administration was also undertaken, showing that chemotherapy switches low-TIL tumors into high-TIL tumors.33 Cytotoxic drugs are able to modify the tumor microenvironment, thus inducing cross-presentation of new peptide antigens, dendritic cell activation, and specific cytotoxic T cells.41–46 This evidence supports the idea that the efficacy of immunotherapy may be amplified by chemotherapy.33 Based on these data, several neoadjuvant trials studying the addition of immunotherapy to chemotherapy in TNBC patients are ongoing. Cytotoxic chemotherapy is the backbone of TNBC treatment. In a large study evaluating the neoadjuvant setting, Liedtke et al evaluated the response to different neoadjuvant chemotherapy regimens in 1,118 patients with early-stage BC treated with different drugs.84 In the subgroup of TNBC, the pCR rate was higher as compared to that among non-TNBC patients (22% vs 11%; p = 0.034), independent of chemotherapy regimens.84 Actually, the standard of care in the neoadjuvant setting for TNBC is sequential anthracycline–taxane-based chemotherapy.5 The pCR rate of these regimens ranges from 28% to 36%.84–86 To increase the rate of response, different chemotherapeutic strategies have been tested (Table 2). Abbreviations: TNBC, triple negative breast cancer; pCR, pathological complete response; Nab-paclitaxel, nanoparticle-albumin-bound paclitaxel. Available evidence suggests a possible clinical benefit in terms of tumor response due to the introduction of nab-paclitaxel instead of weekly paclitaxel. In the phase III GeparSepto study, pCR was reached in 48% of TNBC patients treated with weekly nab-paclitaxel 150 mg/m2 versus 26% of patients treated with weekly paclitaxel 80 mg/m2 (p = 0.00027).87 Of note, the dose of nab-paclitaxel was reduced from 150 to 125 mg/m2 due to the higher incidence of severe sensory neuropathy, without affecting the treatment efficacy.87 A phase III trial (ETNA study) first presented at the the American Society of Clinical Oncology (ASCO) 2016 showed a higher rate of response in the nab-paclitaxel arm compared to the paclitaxel one (41.3% vs 35.5%; p-value not statistically significant).88 Similar pCR rates have been reported by Kuwayama et al in a subgroup of TNBC patients treated with four cycles of weekly nab-paclitaxel 100 mg/m2.89 Moreover, early results from the WSG-ADAPT trial showed a possible advantage in terms of pCR by adding nab-paclitaxel, rather than gemcitabine, to carboplatin (44.5 vs 28.4, p = 0.004).22 Several clinical trials are currently further investigating the role of nab-paclitaxel in this setting. The hypothesis of an increased efficacy of platinum agents in TNBC is based on the fact that these tumors often show functional BRCA1 alterations that increase the sensitivity to cross-linking agents.90 Clinical evidence suggests that the addition of platinum to standard chemotherapy increases the rate of tumor response, but this clinical advantage has not been clearly translated into a survival benefit. Platinum-based chemotherapy has been investigated in several studies, but the best platinum agent, the ideal combination, or the best sequence with other chemotherapy agents remains unknown.91–93 In particular, a retrospective study that compared docetaxel with cisplatin or carboplatin showed the superiority of cisplatin in terms of OS (hazard ratio [HR] 0.49, p = 0.007) and PFS (HR 0.40, p = 0.018) with a quite good tolerability profile.92 This difference between the two platinum agents was not confirmed in another large pooled analysis.94 More consistent are the data on the increased response rate due to the addition of platinum to standard chemotherapy, mainly in anthracycline-free regimens.95–98 The subgroup analysis of five clinical trials, conducted in TNBC patients treated with neoadjuvant platinum-containing therapies combined with taxanes, showed a pCR rate ranging from 33% to 67%.95–99 These data are in accordance with the results from the GeparSixto study, where the addition of carboplatin to anthracycline or taxane-based therapy improved the pCR from 36.9% to 53.2%.100 A large meta-analysis (included six randomized controlled trials and 22 retrospective or prospective studies) strongly confirmed the advantage due to platinum addition in both the objective response rate (86.7%) and the pCR rate (48.4%).94 Data presented at the ASCO 2017 further underline the advantage in tumor response in patients treated with carboplatin/docetaxel compared to taxane–anthracycline-based regimen.101 Data from the WSG-ADAPT TN trial suggested that immune marker gene expression (CD8, PD1, and PFDL1) and high-proliferation markers (proliferation score, Prosigna Breast Cancer Prognostic Gene Signature Assay [PAM-50] risk-of-recurrence [ROR] score, MKI67, CDC20, NUF2, KIF2C, CENPF, EMP3, and TYMS) were positively associated with pCR in carbo-containing chemotherapy regimens.22 In all of these reported studies, the addition of carboplatin increased hematological and non-hematological toxicity, with consequent frequent dose reduction. Nowadays, the increased toxicity and the lack of clear demonstrated long-term survival benefit due to platinum addition constitute reasons why platinum agents are not included in the standard of care for TNBC in the neoadjuvant setting. Despite this, the evidence that the pCR is strongly associated with OS in TNBC is an argument often used by the physicians to justify the addition of carboplatin to NST in clinical practice. Several phase III trials are ongoing and may provide more information on this topic. Dose-dense (DD) chemotherapy aims to achieve maximum tumor death by delivering therapeutic drugs over a shorter duration. The efficacy of DD systemic treatment was mainly investigated in the adjuvant setting. A recent meta-analysis including a total of eight phase III trials (17,188 randomized women) showed that patients treated with DD chemotherapy had better OS and DFS than those on the conventional schedule. In particular, statistically significant OS benefit was observed in patients with hormone-receptor-negative tumors (HR 0.8, p = 0.002).104 Data from the DD schedule in the neoadjuvant setting are less consistent.105 Published clinical trials included women treated with outdated regimens and/or schedules; there are no data regarding the benefit of DD anthracycline–taxane-based primary chemotherapy. Conventionally, in clinical practice, results from DD adjuvant chemotherapy studies are applied in the neoadjuvant setting too. Table 3 summarizes the main clinical trials where targeted agents have been evaluated in addition to NST. Note: *pCR in breast only; §pCR rate in patients treated with six cycles of neoadjuvant treatment. PARP-1 is an enzyme known to be involved in the base-excision repair pathway, which plays a key role in the repair of single-stranded DNA breaks.106,107 During the last decade, drugs able to interfere with the DNA-damage-repair systems and to induce a synthetic lethality, named PARP inhibitors (such as iniparib, olaparib, and veliparib), have been developed. The main evidence is in the metastatic setting, where PARP inhibitors have been tested as single agents and in combination with chemotherapy.9,108 The best results in terms of efficacy emerged from combination with cisplatin or carboplatin, as well as with topotecan and temozolamide, with response rates in BRCA-related BC of up to 73%.109–112 Considering the use of PARP inhibitors in the neoadjuvant setting, a single-arm phase II study showed efficacy in terms of pCR of gemcitabine combined with carboplatin and iniparib in TNBC.113 In this study, the presence of HRD was associated with higher response rates, regardless of BRCA 1/2 mutational status.113 Results from the veliparib and carboplatin arm in the I-SPY-2 trial, a multicenter, adaptively randomized trial, reported 51% pCR in the experimental arm versus 26% in the standard regimen. Considering adverse events, hematological side effects were higher in the veliparib–carboplatin group than in the control arm.114 No difference in the pCR rate due to the addition of velaparib to carboplatin–paclitaxel, followed by doxorubicin plus cyclophosphamide, has been reported in a phase III study presented by the German Breast Group at the ASCO 2017.115 A phase II study of neoadjuvant talazoparib monotherapy in BRCA-associated BC is ongoing at the MD Anderson Cancer Center.116 Considering these preliminary controversial results, PARP inhibitors are still under investigation. Bevacizumab is a humanized monoclonal antibody that targets the main isoforms of circulating vascular endothelial growth factor (VEGF), resulting in the inhibition of angiogenesis, cell tumor growth, and cell survival.117 Bevacizumab use has been investigated in both advanced and early-stage BC treatments, showing an increased response rate – mainly, in TNBC patients.84,100,118–120 When added to chemotherapy in preoperative treatment, the pCR rate ranges from 40% to 59% independent of the chemotherapy regimen administered. The phase III GeparQuinto trial included 663 TNBC patients treated with epirubicin and cyclophosphamide followed by docetaxel with or without bevacizumab, and showed a pCR rate of 39.3% in the bevacizumab arm versus 27.9% in the control arm (p = 0.021).7 The advantage in response rate due to the addition of bevacizumab has been demonstrated in two other large trials. The first one is the multicenter British phase III study (ARTemis), where 781 patients were randomized to receive bevacizumab or placebo plus docetaxel followed by cyclophosphamide, 5-fluorouracil, and epirubicine.121 In the TNBC subgroup, bevacizumab provided an advantage in terms of pCR from 34% to 49%.121 The second one – the CALGB 40603/Alliance trial, conducted in 443 patients with stages II and III TNBC – confirmed the increase of tumor response in the bevacizumab group, independent of the chemotherapy regimen administered.122,123 Similar response rates have been found in two phase II trials: the Ca.Pa.Be study, where 44 TNBC women were treated with a combination of paclitaxel, carboplatin, and bevacizumab, and the KCSG BR-0905 trial, where 45 women were treated with bevacizumab, docetaxel, and carboplatin.124,125 The addition of bevacizumab to nab-paclitaxel was investigated in two phase II trials, showing an increase of response rate compared to bevacizumab plus paclitaxel or docetaxel.126,127 In the first one, the SWOG S0800 trial, the combination of bevacizumab plus nab-paclitaxel, followed by DD doxorubicin and cyclophosphamide, increased the pCR rate up to 59% (p = 0.014).126 In the second one, 50% of TNBC patients treated with bevacizumab plus nab-paclitaxel and carboplatin achieved pCR.127 With regard to safety profile, patients treated with bevacizumab experienced an increased number of immediate and delayed postoperative complications as well as neutropenia and hypertension.121,122 Nowadays, the use of bevacizumab in the neoadjuvant setting is still controversial and not recommended, mainly due to the lack of survival-benefit evidence. The objective response rate before surgery was 100% in the pembrolizumab and carboplatin group versus 80% in the other experimental group (nab-paclitaxel + pembrolizumab); the pCR rate (yT0/Tis yN0) was 90% versus 60%, respectively.128 Similar results have been reported in the subgroup of patients treated with pembrolizumab in the I-SPY-2 trial.129 Data presented at the ASCO 2017 were based on results observed in patients at high risk of relapse using upfront tumor profiling (including mammaPrint 70-gene signature test). Patients were treated with weekly paclitaxel for 12 weeks ± pembrolizumab, followed by anthracyclines.129 In the TNBC women, an absolute increase in the estimated pCR rate of 40% was observed in the pembrolizumab arm (based on the estimated pCR rate of 60% with pembrolizumab plus standard therapy compared to 20% with standard NST alone).129 Currently, two different strategies are under investigation to evaluate the real benefit of immunotherapy in early-stage TNBC: the addition of PD1/PD-L1 inhibitors to different NST regimens and the administration of PD1/PD-L1 inhibitors in the adjuvant setting in patients with residual BC disease after NST. In the first case, four studies are currently recruiting patients: the phase III NeoTRIPaPDL1 trial, a multicenter randomized study with patients treated with nab-paclitaxel plus carboplatin ± atezolizumab;130 the GeparNuevo trial, a phase II study of nab-paclitaxel ± durvalumab followed by epirubicin plus cyclophosphamide; and two other studies with nab-paclitaxel plus atezolizumab or durvalumab.131–133 With regard to the second strategy, two big clinical trials are now ongoing, both conducted in high-risk TNBC patients with residual disease after NST, randomized to receive 1 year of adjuvant pembrolizumab or avelumab versus observation.134,135 The results of all these studies are awaited with high interest. In our opinion, NST should be the first option in the case of operable TNBC, especially in locally advanced cases (when mastectomy is required due to tumor size), as well as in high-grade and high-proliferation-rate tumors. Despite the progress in our understanding of TNBC, anthracycline–taxane-based chemotherapy remains the standard of care for NST in all TNBC subtypes. Platinum agents, as well as PARP-inhibitor agents, provide pCR advantage in different clinical trials, mainly in BRCA-defense tumors, without demonstrating an improvement in survival benefit. At present, there are no clear predictive biomarkers useful in clinical practice. The classification of TNBC using molecular profile showed how TNBCs are a heterogeneous group which explains the lack of survival benefit of experimental drugs tested in several clinical trials. All of the available evidence suggests the necessity of design biology-driven clinical trials wherein TNBC patients may be treated on the basis of tumor molecular profile. Kennedy RD, Quinn JE, Johnston PG, Harkin DP. BRCA1: mechanisms of inactivation and implications for management of patients. Lancet. 2002;360(9338):1007–1014. Birgisdottir V, Stefansson OA, Bodvarsdottir SK, Hilmarsdottir H, Jonasson JG, Eyfjord JE. Epigenetic silencing and deletion of the BRCA1 gene in sporadic breast cancer. Breast Cancer Res. 2006;8(4):R38. Balmaña J, Díez O, Rubio IT, Cardoso F; ESMO Guidelines Working Group. BRCA in breast cancer: ESMO clinical practice guidelines. Ann Oncol. 2011;22 (Suppl 6):vi31–vi34. Senkus E, Kyriakides S, Ohno S, et al; ESMO Guidelines Committee. Primary breast cancer: ESMO Clinical Practice Guidelines for diagnosis, treatment and follow-up. Ann Oncol. 2015;26(Suppl 5):v8–v30. Huober J, von Minckwitz G, Denkert C, et al. Effect of neoadjuvant anthracycline-taxane-based chemotherapy in different biological breast cancer phenotypes: overall results from the GeparTrio study. Breast Cancer Res Treat. 2010;124(1):133–140. Gerber B, Loibl S, Eidtmann H, et al; German Breast Group Investigators. Neoadjuvant bevacizumab and anthracycline-taxane-based chemotherapy in 678 triple-negative primary breast cancers; results from the geparquinto study (GBG 44). Ann Oncol. 2013;24(12):2978–2984. Yardley DA, Shipley DL, Peacock NW, et al. Phase I/II trial of neoadjuvant sunitinib administered with weekly paclitaxel/carboplatin in patients with locally advanced triple-negative breast cancer. Breast Cancer Res Treat. 2015;152(3):557–567. Gucalp A, Tolaney S, Isakoff SJ, et al; Translational Breast Cancer Research Consortium (TBCRC 011). Phase II Trial of bicalutamide in patients with androgen receptor-positive, estrogen receptor-negative metastatic breast cancer. Clin Cancer Res. 2013;19(19):5505–5512. Traina TA, Miller K, Yardley DA, et al. Results from a phase 2 study of enzalutamide (ENZA), an androgen receptor (AR) inhibitor, in advanced AR+ triple-negative breast cancer (TNBC). J Clin Oncol. 2015;33(Suppl 15):abstract 1003. Nabholtz JM, Abrial C, Mouret-Reynier MA, et al. Multicentric neoadjuvant phase II study of panitumumab combined with an anthracycline/taxane-based chemotherapy in operable triple-negative breast cancer: identification of biologically defined signatures predicting treatment impact. Ann Oncol. 2014;25(8):1570–1577. Haffty BG, Yang Q, Reiss M, et al. Locoregional relapse and distant metastasis in conservatively managed triple negative early-stage breast cancer. J Clin Oncol. 2006;24(36):5652–5657. D’Andrea AD, Grompe M. The Fanconi anaemia/BRCA pathway. Nat Rev Cancer. 2003;3(1):23–34. Byrski T, Huzarski T, Dent R, et al. Pathologic complete response to neoadjuvant cisplatin in BRCA1-positive breast cancer patients. Breast Cancer Res Treat. 2014;147(2):401–405. Wang C, Zhang J, Wang Y, et al. Prevalence of BRCA1 mutations and responses to neoadjuvant chemotherapy among BRCA1 carriers and non-carriers with triple-negative breast cancer. Ann Oncol. 2015;26(3):523–528. Silver DP, Richardson AL, Eklund AC, et al. Efficacy of neoadjuvant Cisplatin in triple-negative breast cancer. J Clin Oncol. 2010;28(7):1145–1153. Chabalier C, Lamare C, Racca C, Privat M, Valette A, Larminat F. BRCA1 downregulation leads to premature inactivation of spindle checkpoint and confers paclitaxel resistance. Cell Cycle. 2006;5(9):1001–1007. Telli ML, Timms KM, Reid J et al. Homologous recombination deficiency (HRD) as a predictive biomarkers of response to neoadjuvant platinum-based therapy in patients with triple negative breast cancer. Cancer Res. 2016;76(4 Suppl):P3-07-12. Lehmann BD, Bauer JA, Chen X, et al. Identification of human triple-negative breast cancer subtypes and preclinical models for selection of targeted therapies. J Clin Invest. 2011;121(7):2750–2767. Gluz O, Nitz U, Liedtke C, et al. Comparison of 12 weeks neoadjuvant Nab-paclitaxel combined with carboplatinum vs. gemcitabine in triple-negative breast cancer: WSG-ADAPT TN randomized phase II trial. Cancer Res. 2016;76(4 Suppl): Abstract nr S6-07. Herbst RS. Review of epidermal growth factor receptor biology. Int J Radiat Oncol Biol Phys. 2004;59(2 Suppl):21–26. Zhang H, Berezov A, Wang Q, et al. 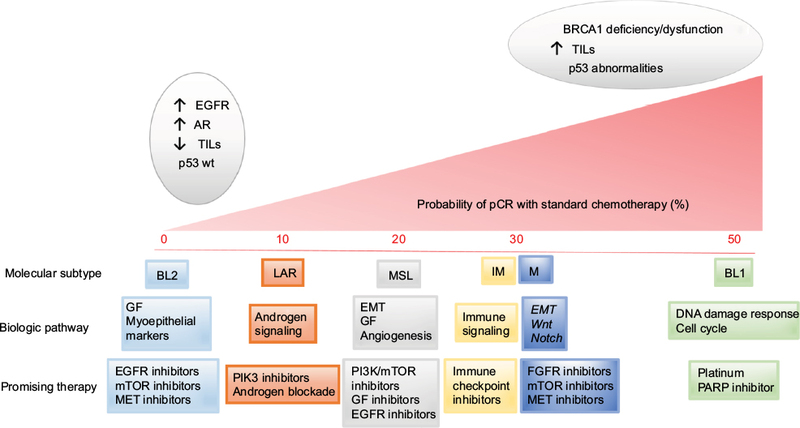 ErbB receptors: from oncogenes to targeted cancer therapies. J Clin Invest. 2007;117(8):2051–2058. Siziopikou KP, Cobleigh M. The basal subtype of breast carcinomas may represent the group of breast tumors that could benefit from EGFR-targeted therapies. Breast. 2007;16(1):104–107. Bidard FC, Conforti R, Boulet T, Michiels S, Delaloge S, André F. Does triple-negative phenotype accurately identify basal-like tumour? An immunohistochemical analysis based on 143 ‘triple-negative’ breast cancers. Ann Oncol. 2007;18(7):1285–1286. Nogi H, Kobayashi T, Suzuki M, et al. EGFR as paradoxical predictor of chemosensitivity and outcome among triple-negative breast cancer. Oncol Rep. 2009;21(2):413–417. Liu D, He J, Yuan Z, et al. EGFR expression correlates with decreased disease-free survival in triple negative breast cancer: a retrospective analysis based on a tissue microarray. Med Oncol. 2012;29(2):401–405. Ferraro DA, Gaborit N, Maron R, et al. Inhibition of triple-negative breast cancer models by combinations of antibodies to EGFR. Proc Natl Acad Sci U S A. 2013;110(5):1815–1820. Denkert C, Loibl S, Noske A, et al. Tumor-associated lymphocytes as an independent predictor of response to neoadjuvant chemotherapy in breast cancer. J Clin Oncol. 2010;28(1):105–113. Dieci MV, Criscitiello C, Goubar A, et al. Prognostic value of tumor-infiltrating lymphocytes on residual disease after primary chemotherapy for triple-negative breast cancer: a retrospective multicenter study. Ann Oncol. 2014;25(3):611–618. Vinayak S, Gray RJ, Adams S, et al. Association of increased tumor-infiltrating lymphocytes (TILs) with immunomodulatory (IM) triple-negative breast cancer (TNBC) subtype and response to neoadjuvant platinum-based therapy in PrECOG0105. J Clin Oncol. 2014;32(Suppl 15): abstract 1000. Salgado R, Denkert C, Demaria S, et al; International TILs Working Group 2014. The evaluation of tumor-infiltrating lymphocytes (TILS) in breast cancer: Recommendations by an International TILS Working Group 2014. Ann Oncol. 2015;26(2):259–271. Pruneri G, Vingiani A, Bagnardi V, et al. Clinical validity of tumor-infiltrating lymphocytes analysis in patients with triple-negative breast cancer. Ann Oncol. 2016;27(2):249–256. Loi S, Michiels S, Salgado R, et al. Tumor infiltrating lymphocytes are prognostic in triple negative breast cancer and predictive for trastuzumab benefit in early breast cancer: results from the FinHER trial. Ann Oncol. 2014;25(8):1544–1550. Adams S, Gray RJ, Demaria S, et al. Prognostic value of tumor-infiltrating lymphocytes in triple-negative breast cancers from two phase III randomized adjuvant breast cancer trials: ECOG 2197 and ECOG 1199. J Clin Oncol. 2014;32(27):2959–2966. Cimino-Mathews A, Foote JB, Emens LA. Immune targeting in breast cancer. Oncology (Williston Park). 2015;29(5):375–385. Denkert C, von Minckwitz G, Darb-Esfahani S, et al. Evaluation of tumor-infiltrating lymphocytes (TILs) as predictive and prognostic biomarker in different subtypes of breast cancer treated with neoadjuvant therapy – a metaanalysis of 3771 patients. Cancer Res. 2017; 77(4 Suppl):Abstract nr S1-09. Zitvogel L, Apetoh L, Ghiringhelli F, André F, Tesniere A, Kroemer G. The anticancer immune response: indispensable for therapeutic success? J Clin Invest. 2008;118(6):1991–2001. Roselli M, Cereda V, di Bari MG, et al. Effects of conventional therapeutic interventions on the number and function of regulatory T cells. Oncoimmunology. 2013;2(10):e27025. Jäger D, Jäger E, Knuth A. Immune responses to tumour antigens: implications for antigen specific immunotherapy of cancer. J Clin Pathol. 2001;54(9):669–674. Apetoh L, Ghiringhelli F, Tesniere A, et al. Toll-like receptor 4-dependent contribution of the immune system to anticancer chemotherapy and radiotherapy. Nat Med. 2007;13(9):1050–1059. Andre F, Dieci MV, Dubsky P, et al. Molecular pathways: involvement of immune pathways in the therapeutic response and outcome in breast cancer. Clin Cancer Res. 2013;19(1):28–33. Berke G. The binding and lysis of target cells by cytotoxic lymphocytes: molecular and cellular aspects. Annu Rev Immunol. 1994;12:735–773. Segal NH, Parsons DW, Peggs KS, et al. Epitope landscape in breast and colorectal cancer. Cancer Res. 2008;68(3):889–892. Zitvogel L, Kepp O, Kroemer G. Immune parameters affecting the efficacy of chemotherapeutic regimens. Nat Rev Clin Oncol. 2011;8(3):151–160. Liyanage UK, Moore TT, Joo HG, et al. Prevalence of regulatory T cells is increased in peripheral blood and tumor microenvironment of patients with pancreas or breast adenocarcinoma. J Immunol. 2002;169(5):2756–2761. Viguier M, Lemaître F, Verola O, et al. Foxp3 expressing CD4+CD25(high) regulatory T cells are overrepresented in human metastatic melanoma lymph nodes and inhibit the function of infiltrating T cells. J Immunol. 2004;173(2):1444–1453. Miyashita M, Sasano H, Tamaki K, et al. Prognostic significance of tumor-infiltrating CD8+ and FOXP3+ lymphocytes in residual tumors and alterations in these parameters after neoadjuvant chemotherapy in triple-negative breast cancer: a retrospective multicenter study. Breast Cancer Res. 2015;17:124. Wimberly H, Brown JR, Schalper K, et al. PD-L1 expression correlates with tumor-infiltrating lymphocytes and response to neoadjuvant chemotherapy in breast cancer. Cancer Immunol Res. 2015;3(4):326–332. Ghebeh H, Mohammed S, Al-Omair A, et al. The B7-H1 (PD-L1) T lymphocyte-inhibitory molecule is expressed in breast cancer patients with infiltrating ductal carcinoma: correlation with important high-risk prognostic factors. Neoplasia. 2006;8(3):190–198. Mittendorf EA, Philips AV, Meric-Bernstam F, et al. PD-L1 expression in triple-negative breast cancer. Cancer Immunol Res. 2014;2(4):361–370. Beckers RK, Selinger CI, Vilain R, et al. Programmed death ligand 1 expression in triple-negative breast cancer is associated with tumour-infiltrating lymphocytes and improved outcome. Histopathology. 2016;69(1):25–34. Robert C, Long GV, Brady B, et al. Nivolumab in previously untreated melanoma without BRAF mutation. N Engl J Med. 2015;372(4):320–330. Brahmer J, Reckamp KL, Baas P, et al. Nivolumab versus docetaxel in advanced squamous-cell non-small-cell lung cancer. N Engl J Med. 2015;373(2):123–135. Ferris RL, Blumenschein G Jr, Fayette J, et al. Nivolumab for recurrent squamous-cell carcinoma of the head and neck. N Engl J Med. 2016;375(19):1856–1867. Collins LC, Cole Ks, Marotti JD, Hu R, Schnitt SJ, Tamimi RM. Androgen receptor expression in breast cancer in relation to molecular phenotype: results from the Nurses’ Health Study. Mod Pathol. 2011;24(7):924–931. Mrklić I, Pogorelić Z, Capkun V, Tomić S. Expression of androgen receptors in triple negative breast carcinomas. Acta Histochem. 2013;115(4):344–348. Thike AA, Yong-Zheng Chong L, Cheok PY, et al. Loss of androgen receptor expression predicts early recurrence in triple-negative and basal-like breast cancer. Mod Pathol. 2014;27(3):352–360. Safarpour D, Pakneshan S, Tavassoli FA. Androgen receptor (AR) expression in 400 breast carcinomas: is routine AR assessment justified? Am J Cancer Res. 2014;4(4):353–368. eCollection 2014. Agoff SN, Swanson PE, Linden H, Hawes SE, Lawton TJ. Androgen receptor expression in estrogen receptor–negative breast cancer. Immunohistochemical, clinical, and prognostic associations. Am J Clin Pathol. 2003;120(5):725–731. Park S, Koo J, Park HS, et al. Expression of androgen receptors in primary breast cancer. Ann Oncol. 2010;21(3):488–492. Masuda H, Baggerly KA, Wang Y, et al. Differential response to neoadjuvant chemotherapy among 7 triple-negative breast cancer molecular subtypes. Clin Cancer Res. 2013;19(19):5533–5540. Cochrane DR, Bernales S, Jacobsen BM, et al. Role of the androgen receptor in breast cancer and preclinical analysis of enzalutamide. Breast Cancer Res. 2014;16(1):R7. M. D. Anderson Cancer Center. Phase IIB neoadjuvant enzalutamide (ZT) plus taxol for androgen receptor (AR)-positive triple-negative breast cancer (AR+ TNBC). Available from: https://clinicaltrials.gov/ct2/show/NCT02689427. NLM identifier: NCT02689427. Accessed December 8, 2017. Ceresa BP, Bahr SJ. rab7 activity affects epidermal growth factor: epidermal growth factor receptor degradation by regulating endocytic trafficking from the late endosome. J Biol Chem. 2006;281(2):1099–1106. Guarneri V, Barbieri E, Piacentini F, et al. Predictive and prognostic role of p53 according to tumor phenotype in breast cancer patients treated with preoperative chemotherapy: a single-institution analysis. Int J Biol Markers. 2010;25(2):104–111. Yadav BS, Chanana P, Jhamb S. Biomarkers in triple negative breast cancer: a review. World J Clin Oncol. 2015;6(6):252–263. Han JS, Cao D, Molberg KH, et al. Hormone receptor status rather than HER2 status is significantly associated with increased Ki-67 and p53 expression in triple-negative breast carcinomas, and high expression of Ki-67 but not p53 is significantly associated with axillary nodal metastasis in triple-negative and high-grade non-triple-negative breast carcinomas. Am J Clin Pathol. 2011;135(2):230–237. Langerød A, Zhao H, Borgan Ø, et al. TP53 mutation status and gene expression profiles are powerful prognostic markers of breast cancer. Breast Cancer Res. 2007;9(3):R30. Miller LD, Smeds J, George J, et al. An expression signature for p53 status in human breast cancer predicts mutation status, transcriptional effects, and patient survival. Proc Natl Acad Sci U S A. 2005;102(38):13550–13555. Biganzoli E, Coradini D, Ambrogi F, et al. p53 status identifies two subgroups of triple-negative breast cancers with distinct biological features. Jpn J Clin Oncol. 2011;41(2):172–179. Turner N, Moretti E, Siclari O, et al. Targeting triple negative breast cancer: is p53 the answer? Cancer Treat Rev. 2013;39(5):541–550. Walerych D, Napoli M, Collavin L, Del Sal G. The rebel angel: mutant p53 as the driving oncogene in breast cancer. Carcinogenesis. 2012;33(11):2007–2017. Bidard FC, Matthieu MC, Chollet P, et al. p53 status and efficacy of primary anthracyclines/alkylating agent-based regimen according to breast cancer molecular classes. Ann Oncol. 2008;19(7):1261–1265. von Minckwitz G, Untch M, Nüesch E, et al. Impact of treatment characteristics on response of different breast cancer phenotypes: pooled analysis of the German neo-adjuvant chemotherapy trials. Breast Cancer Res Treat. 2011;125(1):145–156. von Minckwitz G, Untch M, Blohmer JU, et al. Definition and impact of pathologic complete response on prognosis after neoadjuvant chemotherapy in various intrinsic breast cancer subtypes. J Clin Oncol. 2012;30(15):1796–1804. Untch M, Jackisch C, Schneeweiss A, et al; German Breast Group (GBG); Arbeitsgemeinschaft Gynäkologische Onkologie—Breast (AGO-B) Investigators. Nab-paclitaxel versus solvent-based paclitaxel in neoadjuvant chemotherapy for early breast cancer (GeparSepto-GBG 69): a randomised, phase 3 trial. Lancet Oncol. 2016;17(3):345–356. Gianni L, Mansutti M, Anton A, et al. ETNA (evaluating treatment with neoadjuvant abraxane) randomized phase III study comparing neoadjuvant nab-paclitaxel (nab-P) versus paclitaxel (P) both followed by anthracycline regimens in women with HER2-negative high-risk breast cancer: a MICHELANGO study. J Clin Oncol. 2016;34(Suppl 15):abstract 502. Kuwayama T, Yamauchi H, Takano T, et al. Primary analysis of a randomized phase II, multicenter trial: neoadjuvant weekly nab-paclitaxel 100 mg/m2 followed by FE100C compared with docetaxel 75 mg/m2 followed by FE100C for early breast cancer in Japan. J Clin Oncol. 2015;33(Suppl 28):abstract 136. Stefansson OA, Villanueva A, Vidal A, Martí L, Esteller M. BRCA1 epigenetic inactivation predicts sensitivity to platinum-based chemotherapy in breast and ovarian cancer. Epigenetics. 2012;7(11):1225–1229. Chen XS, Yuan Y, Garfield DH, Wu JY, Huang O, Shen KW. Both carboplatin and bevacizumab improve pathological complete remission rate in neoadjuvant treatment of triple negative breast cancer: a meta-analysis. PLoS One. 2014;9(9):e108405. Hurley J, Reis IM, Rodgers SE, et al. The use of neoadjuvant platinum-based chemotherapy in locally advanced breast cancer that is triple negative: retrospective analysis of 144 patients. Breast Cancer Res Treat. 2013;138(3):783–794. von Minckwitz G, Martin M. Neoadjuvant treatments for triple-negative breast cancer (TNBC). Ann Oncol. 2012;23(Suppl 6):vi35–vi39. Petrelli F, Coinu A, Borgonovo K, et al. The value of platinum agents as neoadjuvant chemotherapy in triple-negative breast cancers: a systematic review and meta-analysis. Breast Cancer Res Treat. 2014;144(2):223–232. Sikov WM, Dizon DS, Strenger R, et al. Frequent pathologic complete responses in aggressive stages II to III breast cancers with every-4-week carboplatin and weekly paclitaxel with or without trastuzumab: a Brown University Oncology Group Study. J Clin Oncol. 2009;27(28):4693–4700. Chen XS, Nie XQ, Chen CM, et al. Weekly paclitaxel plus carboplatin is an effective nonanthracycline-containing regimen as neoadjuvant chemotherapy for breast cancer. Ann Oncol. 2010;21(5):961–967. Roy V, Pockaj BA, Allred JB, et al. A Phase II trial of docetaxel and carboplatin administered every 2 weeks as preoperative therapy for stage II or III breast cancer: NCCTG study N0338. Am J Clin Oncol. 2013;36(6):540–544. Chang HR, Glaspy J, Allison MA, et al. Differential response of triple-negative breast cancer to a docetaxel and carboplatin-based neoadjuvant treatment. Cancer. 2010;116(18):4227–4237. Campos Gomez S, Campos Gomez KA, Garcia Garces M, Morelos G, Hernandez Alvarez J. Neoadjuvant carboplatin and docetaxel in locally advanced triple negative breast cancer: a Hispanic trial. J Clin Oncol. 2016;34(Suppl 15):abstract e12554. von Minckwitz G, Schneeweiss A, Loibl S, et al. Neoadjuvant carboplatin in patients with triple-negative and HER2-positive early breast cancer (GeparSixto; GBG 66): a randomised phase 2 trial. Lancet Oncol. 2014;15(7):747–756. Enriquez D, Poma Nieto N, Fuentes HA, Guerra H, Ruiz Mendoza RE, Gomez HL. Improving pathological response in locally advanced triple negative breast cancer: comparison between CbD and AC-T regimens. J Clin Oncol. 2017;35(Suppl 15):abstract 585. Kaklamani VG, Jeruss JS, Hughes E, et al. Phase II neoadjuvant clinical trial of carboplatin and eribulin in women with triple negative early-stage breast cancer (NCT01372579). Breast Cancer Res Treat. 2015;151(3):629–638. Northwestern University. Carboplatin and eribulin mesylate in triple negative breast cancer patients. Avalaible from: https://clinicaltrials.gov/ct2/show/NCT01372579. NLM identifier: NCT01372579. Accessed June 1, 2011. Petrelli F, Cabiddu M, Coinu A, et al. Adjuvant dose-dense chemotherapy in breast cancer: a systematic review and meta-analysis of randomized trials. Breast Cancer Res Treat. 2015;151(2):251–259. Reinisch M, Ataseven B, Kümmel S. Neoadjuvant dose-dense and dose-intensified chemotherapy in breast cancer – review of the literature. Breast Care (Basel). 2016;11(1):13–20. Hastak K, Alli E, Ford JM. Synergistic chemosensitivity of triple-negative breast cancer cell lines to poly(ADP-Ribose) polymerase inhibition, gemcitabine and cisplatin. Cancer Res. 2010;70(20):7970–7980. Alli E, Sharma VB, Sunderesakumar P, Ford JM. Defective repair of oxidative dna damage in triple-negative breast cancer confers sensitivity to inhibition of Poly(ADP-ribose) polymerase. Cancer Res. 2009;69(8):3589–3596. Gelmon KA, Tischkowitz M, Mackay H, et al. Olaparib in patients with recurrent high-grade serous or poorly differentiated ovarian carcinoma or triple-negative breast cancer: a phase 2, multicentre, open-label, non-randomised study. Lancet Oncol. 2011;12(9):852–861. Somlo G, Frankel PH, Luu TH, et al. Efficacy of the combination of ABT-888 (veliparib) and carboplatin in patients with BRCA-associated breast cancer. J Clin Oncol. 2013;31(Suppl 15):abstract 1024. Pahuja S, Beumer JH, Appleman LJ, et al. A phase I study of veliparib (ABT-888) in combination with weekly carboplatin and paclitaxel in advanced solid malignancies and enriched for triple-negative breast cancer (TNBC). J Clin Oncol. 2015;33(Suppl 15):abstract 1015. Kummar S, Chen A, Ji J, et al. Phase I study of PARP inhibitor ABT-888 in combination with topotecan in adults with refractory solid tumors and lymphomas. Cancer Res. 2011;71(17):5626–5634. Telli ML, Jensen KC, Vinayak S, et al. Phase II study of gemcitabine, carboplatin, and iniparib as neoadjuvant therapy for triple-negative and BRCA1/2 mutation-associated breast cancer with assessment of a tumor-based measure of genomic instability: PrECOG 0105. J Clin Oncol. 2015;33(17):1895–1901. Rugo HS, Olapade O, DeMichele A, et al. Veliparib/carboplatin plus standard neoadjuvant therapy for high-risk breast cancer: first efficacy results from the I-SPY 2 TRIAL. Cancer Res. 2013;73(24 Suppl):Abstract nr S5-02. Geyer CE, O’Shaughnessy J, Untch M, et al. Phase 3 study evaluating efficacy and safety of veliparib (V) plus carboplatin (Cb) or Cb in combination with standard neoadjuvant chemotherapy (NAC) in patients (pts) with early stage triple-negative breast cancer (TNBC). J Clin Oncol. 2017;35(Suppl 15):abstract 520. M.D. Anderson Cancer Center. Neoadjuvant talazoparib for patients with a BRCA deleterious mutation. Available from: https://clinicaltrials.gov/ct2/show/NCT02282345. NLM Identifier: NCT02282345. Accessed October 30, 2014. Greenberg S, Rugo HS. Triple-negative breast cancer: role of antiangiogenic agents. Cancer J. 2010;16(1):33–38. von Minckwitz G, Eidtmann H, Rezai M, et al; German Breast Group; Arbeitsgemeinschaft Gynäkologische Onkologie–Breast Study Groups. Neoadjuvant chemotherapy and bevacizumab for HER2-negative breast cancer. N Engl J Med. 2012;366(4):299–309. Thomssen C, Pierga JY, Pritchard KI, et al. First-line bevacizumab-containing therapy for triple-negative breast cancer: analysis of 585 patients treated in the ATHENA study. Oncology. 2012;82(4):218–227. O’Shaughnessy J, Romieu G, Diéras V, Byrtek M, Duenne A-A, Miles D. Meta-analysis of patients with triple-negative breast cancer (TNBC) from three randomized trials of first-line bevacizumab (BV) and chemotherapy treatment for metastatic breast cancer (MBC). Cancer Res. 2010;70(24 Suppl):P6-12-03. Earl HM, Hiller L, Dunn JA, et al; ARTemis Investigators. Efficacy of neoadjuvant bevacizumab added to docetaxel followed by fluorouracil, epirubicin, and cyclophosphamide, for women with HER2-negative early breast cancer (ARTemis): an open-label, randomised, phase 3 trial. Lancet Oncol. 2015;16(6):656–666. Sikov WM, Berry DA, Perou CM, et al. Impact of the addition of carboplatin and/or bevacizumab to neoadjuvant once-per-week paclitaxel followed by dose-dense doxorubicin and cyclophosphamide on pathologic complete response rates in stage II to III triple-negative breast cancer: CALGB 40603 (Alliance). J Clin Oncol. 2015;33(1):13–21. Golshan M, Cirrincione CT, Carey LA, et al. Impact of neoadjuvant therapy on breast conservation rates in triple-negative and HER2-positive breast cancer: combined results of CALGB 40603 and 40601 (Alliance). J Clin Oncol. 2015;33(Suppl 15):abstract 1007. Guarneri V, Dieci MV, Bisagni G, et al. Preoperative carboplatin-paclitaxel-bevacizumab in triple-negative breast cancer: final results of the phase II Ca.Pa.Be study. Ann Surg Oncol. 2015;22(9):2881–2887. Kim HR, Jung KH, Im SA, et al. Multicentre phase II trial of bevacizumab combined with docetaxel-carboplatin for the neoadjuvant treatment of triple-negative breast cancer (KCSG BR-0905). Ann Oncol. 2013;24(6):1485–1490. Nahleh ZA, Barlow WE, Hayes DF, et al. SWOG S0800 (NCI CDR0000636131): addition of bevacizumab to neoadjuvant nab-paclitaxel with dose-dense doxorubicin and cyclophosphamide improves pathologic complete response (pCR) rates in inflammatory or locally advanced breast cancer. Breast Cancer Res Treat. 2016;158(3):485–495. Mrózek E, Layman R, Ramaswamy B, et al. Phase II trial of neoadjuvant weekly nanoparticle albumin-bound paclitaxel, carboplatin, and biweekly bevacizumab therapy in women with clinical stage II or III HER2-negative breast cancer. Clin Breast Cancer. 2014;14(4):228–234. Schmid P, Park YH, Muñoz-Couselo E, et al. Pembrolizumab (pembro) + chemotherapy (chemo) as neoadjuvant treatment for triple negative breast cancer (TNBC): preliminary results from KEYNOTE-173. J Clin Oncol. 2017;35(Suppl 15):abstract 556. Nanda R, Liu MC, Yau C, et al. Pembrolizumab plus standard neoadjuvant therapy for high-risk breast cancer (BC): results from I-SPY 2. J Clin Oncol. 2017;35(Suppl 15):abstract 506. Fondazione Michelangelo. Neoadjuvant therapy in TRIPle negative breast cancer with antiPDL1 (NeoTRIPaPDL1). Available from: https://clinicaltrials.gov/ct2/show/NCT02620280. NLM Identifier: NCT02620280. Accessed November 3, 2015. M.D. Anderson Cancer Center. Triple-negative first-line study: neoadjuvant trial of nab-paclitaxel and MPDL3280A, a Pdl-1 inhibitor in patients with triple negative breast cancer. Avalaible from: https://clinicaltrials.gov/ct2/show/NCT02530489. NLM Identifier: NCT02530489. Accessed August 19, 2015. Yale University. Neoadjuvant MEDI4736 concomitant with weekly nab-paclitaxel and dose-dense AC for stage I–III triple negative breast cancer. Available from: https://clinicaltrials.gov/ct2/show/NCT02489448. NLM Identifier: NCT02489448. Accessed July 1, 2015. Merck Sharp & Dohme Corp. Safety and efficacy study of pembrolizumab (MK-3475) in combination with chemotherapy as neoadjuvant treatment for participants with triple negative breast cancer (TNBC) (MK-3475-173/KEYNOTE 173). Available from: https://clinicaltrials.gov/show/NCT02622074. NLM Identifier: NCT02622074. Accessed December 2, 2015. National Cancer Institute (NCI). Pembrolizumab in treating patients with triple-negative breast cancer. Available from: https://clinicaltrials.gov/ct2/show/NCT02954874. NLM Identifier: NCT02954874. Accessed November 3, 2016. Pierfranco Conte, Istituto Oncologico Veneto IRCCS. Adjuvant treatment for high-risk triple negative breast cancer patients with the anti-PD-l1 antibody avelumab (A-Brave). Available from: https://clinicaltrials.gov/ct2/show/NCT02926196. NLM Identifier: NCT02926196. Accessed October 5, 2016. Denduluri N, Somerfield MR, Eisen A, et al. Selection of optimal adjuvant chemotherapy regimens for human epidermal growth factor receptor 2 (HER2) – negative and adjuvant targeted therapy for HER2-positive breast cancers: an American Society of Clinical Oncology Guideline Adaptation of the Cancer Care Ontario Clinical Practice Guideline. J Clin Oncol. 2016;34(20):2416–2427.